A great cast reprieved this pleasantly easygoing (if slightly underwhelming) drama. 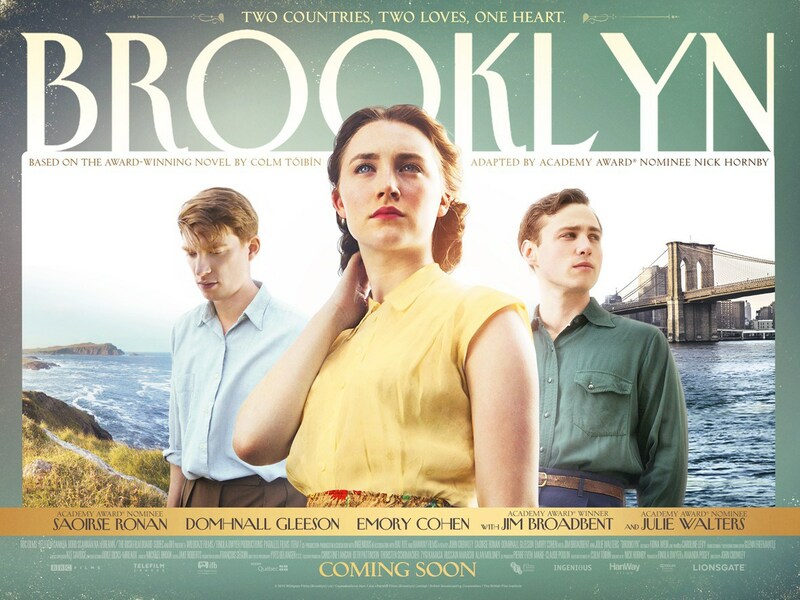 An Irish immigrant (Saoirse Ronan) lands in 1950s Brooklyn, where she quickly falls into a new romance. When her past catches up with her, however, she must choose between two countries and the lives that exist within. Ronan has developed into quite the actress. Brooklyn was the perfect showcase for her. She gave an excellent performance and carried the piece very well. BUT for all the hype and praise, I expected so much more. BUT that’s not to say, I didn’t enjoy it. The opening half hour was easygoing enough as Eilis (Ronan) prepared to embark on the journey of a lifetime. The petty squabbling with Brid Brennan’s scornful shopkeeper and teary send offs with Eilis’ sister and mother kept things ticking over. Her journey to America certainly picked up the pace. The conditions in which she travelled in were surprising. Crammed into small compartments and forced to share the same toilet. Things got even worse when the poor girl suffered from food poisoning. Eva Birthistle (Ae Fond Kiss) delivered a memorable turn in the small role of Eilis’ seasoned travel companion. Sending Eilis on her way with some handy advice. Once Eilis got to America, the pace did slacken BUT you could feel for her as she struggled to fit in with her job at a department store with the stern Miss Fortini (Mad Men’s Jessica Pare). The homesick letter sequences between Eilis and her sister Rose (Fiona Glascott – Omagh) managed to crack the most cynical of critics. I noticed a few teary eyes. No, not mine. I loved how they conveyed their relationship over a few simple letters. Well done. Julie Walters was brilliant and on fine form as the hilarious and uptight boarding house keeper Mrs Keogh. I couldn’t believe that Felicity Smoak from Arrow (Emily Bett Rickards) featured as one of the vindictive boarding house girls. Desperate to snag a man. Jim Broadbent gave a stellar supporting performance as Father Flood and delivered a convincing Irish accent. Aiding Eilis in her time of need. I really wished he was in this more. BUT of course, it wasn’t long before our heroine fell in love. Awww (Yuck). Emory Cohen wasn’t strong enough for me as Tony. He didn’t quite pull off the cheeky Italian American that well. BUT he did have good chemistry with Ronan which made up for the hammy performance and I was happy to watch the pair’s blossoming romance. However after receiving some tragic news, Eilis must return home. I will admit I haven’t read the novel and if it wasn’t for the heavily flogged trailers, the news would have been more of a shocker. Alas it was not to be. Eilis must make a choice to stay home or go back to the love of her life as more and more temptations are thrown in her path. Domhnall Gleeson (About Time) did well with the role of Jim Farrell BUT the character didn’t really have enough screen time to make a convincing option for Eilis. I understand that it might have been a retread of what we had already seen with Tony BUT you could see how he was appealing to Eilis on a different level. For the all the potential drama hanging over her with the community and her mother’s desperate efforts to keep her home, it didn’t quite kick off as much as I had expected. It was all far too tame. Director John Crowley (Boy A) and writer Nick Hormby (About A Boy) only scraped the surface of immigration. A touching scene where Eilis assists at a soup kitchen hit home. The majority of the homeless being Irish immigrants who had tried to find a better life in America. BUT it was a little too light and fluffy. Despite some touching moments and that meandering build up, the ending was quite rushed and far too abrupt for my liking. A superb cast and an easygoing pace do just enough to keep things watchable. BUT for all the praise, I was left wanting. Shame.